Today, I'm going to go over the mechanics from Kaladesh block and Amonkhet block. Very Popular – This means that through our market research, this mechanic falls in the top 25% of mechanics of all time. Note that all these categories are comparing the current mechanics against the mechanics of all time (well, since we started doing market research many years ago), so getting in this top section is difficult. Popular – This means that through our marketing research, this mechanic falls above the average but not in the top 25%. Liked – This means that through our research, this mechanic falls below average but not in the bottom 25%. I should note that we aim for our average to be well liked, so being below average doesn't mean the majority of players don't like it, just that there are other mechanics they like more. Being in this category doesn't keep you from having a chance to return. Unpopular – This means that our research puts this mechanic in the bottom 25%. Falling in this last section does decrease the chance of a return. Large – This means that this mechanic has lots and lots of design space. We can bring it back again and again and most likely won't have any issues making new cards. Medium – This means that this mechanic has a decent amount of design space and we could easily bring it back, but possibly a limited number of times. Small – This mechanic is pushing the boundaries of its design space in this set. It would be difficult to make enough new cards to bring it back. Flexible – This mechanic is easy to use, requires minimal support, and interconnects easily with other mechanics. Neutral – This mechanic is a bit harder to use, often requires some support, and/or has issues when connecting to other mechanics. Rigid – This mechanic is very hard to use, requires extensive infrastructure to work, and/or is actively hostile when trying to mix with other mechanics. Not Problematic – Easy to develop, no major challenges for Play Design to overcome. Neutral – There are challenges for Play Design to tackle and will require special care in testing and development. Most mechanics fall into this category. Problematic – There are major challenges for Play Design. It may cause them to pull back on the theme, erring on the side of less impact in Constructed. Playability Not Affected – This means the mechanic had no issues interfering with playing it. Playability Affected – This means the mechanic had one or more issues that interfered with playing it. With all that covered, it's time to start grading mechanics. This one's hard to grade as colored artifacts aren't a thing we've specifically asked about in market research, although many of the individual cards have fared well. From a design standpoint, colored artifacts are basically as big a design vein as colorless artifacts (possibly bigger due to the developmental issues listed below), so it's a large design vein. There are a number of questions about when and where artifacts should be colored, but that's more on execution than design potential. A set could have a single colored artifact, and nothing in the set would need to be added to support it. It is something we can weave into a design and add synergy with, but the mechanic doesn't require it. Colorless artifacts can be tricky to balance, as if they're powerful enough to go into one deck, why can't they go into every deck? To solve this, Play Design tends to push the artifacts that are more specialized in function. Adding a colored mana cost to an artifact is a huge tool to allow them to push it without it ending up in every deck. Players figure out pretty quick how an artifact with a colored mana cost works. The biggest issue is recognizing that it's an artifact on the battlefield, but we have special frames for colored artifacts to help players recognize this fact. One of the ongoing problems we've had is that players really like artifacts, but sets with strong artifact themes have traditionally caused major play design issues. The solution to this problem moving forward is being more liberal with the use of colored artifacts. It's going to be shifting from an occasional thing to a more frequent thing, thus my deciduous 2 rating. Energy was the highest ranking mechanic of Kaladesh block. I should note that we rank mechanics early in the set's life, so it doesn't tend to be reflective of the audience's attitude later in the set's life. Energy resulted in a lot of broken cards that warped the environment and required banning, so if we tested it now, odds are it would rank lower than it did initially. Energy is an alternate resource. It's not quite as robust as mana, but it's pretty robust. There are a lot of different cards you can design with it. Note that it was named very generically to allow us to use it with a variety of different flavors. Energy requires an environment built around it. It would be hard, for instance, to just put one energy card in a set. There is a world where energy is just how we do charge counters, which would allow us to do a smaller number of them, but that would have giant play design ramifications. I'll just quote Ian Duke, the person who runs the Play Design team: "Energy is parasitic, meaning it really only works well with itself, and the more you have in your deck, the better it is. This creates a 'knife's edge' balance problem. Either energy is strong enough to show up, or it isn't. Of course, we don't want a new, splashy mechanic not to be viable, so we try to position it to be strong enough. If energy turns out slightly stronger than we intend, it runs the risk of showing up too much and pushing out other non-energy cards and strategies." Energy uses a brand-new counter and requires the player to track how much they have of it (and their opponents' energy strategically). It's definitely an above-average mechanic in terms of the amount of focus needed to play with it. This mechanic was more liked than loved, but very few actively disliked it. It's definitely what R&D calls a "workhorse mechanic" in that it's not splashy, but very functional. When we first created this mechanic, we thought that it was going to have a lot of design space, but we learned that costing the mechanic such that it's an interesting decision between the two choices was very difficult, thus it's a smaller design vein. The mechanic can work in a vacuum, but really encourages some +1/+1 counter and creature token synergy. The two big issues for Play Design were 1) fabricate cards are hard to cost correctly for Constructed and 2) there's a limit to how many creature tokens a Constructed environment can support. The mechanic requires playing with both +1/+1 counters and creature tokens. Fabricate was generally well liked and played well. Its narrow design space and play design issues push it up a little on the scale. Vehicles were pretty well liked when they premiered, and continue to have many fans. The biggest issue with design space is that a lot of Vehicle designs will look alike, so any one set can't have too many of them. Luckily, they work best in smaller number as any one deck doesn't want too many Vehicles. The only thing Vehicles require is a substantial amount of creatures, and as the average Magic set is over 50% creatures, we're good to go. Quoting Ian Duke: "Colorless Vehicles in particular are tricky to balance, because if they are generically strong, they'll end up in every deck. So, we need to find designs that make sense in certain decks but not others. Vehicles are naturally better at attacking than blocking, which can push toward snowball gameplay. Vehicles are at their most effective against control decks with sweepers and sorcery-speed removal, so having too many strong Vehicles can push out those strategies." Vehicles are a little on the complicated side which is why we've started only using them at uncommon or higher. They are super flavorful though, and that helps a little with getting the essence of how they work. Vehicles are deciduous so they get a rating of 2. I do think that you'll see us experiment with colored Vehicles, as that solves some of the issues Ian was raising. Players liked convoke, so it's no surprise that improvise (called "artifact convoke" early in its life) is also popular, although, not quite as popular. Technically, just about any spell effect can be given improvise, but in order for it to have an impact, the spell tends to want a cost that's a little higher so that reducing its cost means something. This restriction lessens the useful design space a bunch. The mechanic requires a strong artifact infrastructure to work. Artifact themes, while developmentally dangerous, are quite popular with the players. The mechanic is safer than affinity for artifacts as the reduction cost is gated to one mana per artifact. The bigger problem for Play Design is it's a tricky mechanic to push for Constructed because it requires such a specific deck to be relevant. There's a little bit of counting, but players mostly didn't have issues with the gameplay. This is a good, but narrow, mechanic. I believe we'll have artifact themes and subthemes again, so I could imagine one of them might bring back improvise. Revolt was slightly more popular than improvise. It had a lot of synergy with Kaladesh block and one of the cards with the mechanic, Fatal Push, became a major player in numerous formats. Revolt is most similar to morbid from Innistrad block. There are a number of different ways to use it allowing a decent amount of flexibility, but it's the kind of mechanic that you don't want too much of in any one set. It has the normal issues when it triggers at end of turn, as the list of relevant effects isn't that long. It's also limited as an effect booster as there is only so many effects that have clean upgrades. Revolt is the kind of mechanic that can work in any set (creatures die in most games) but is improved when it's synergistic with the other mechanics in the set. I don't see us using it in a set if other aspects of that set don't up its relevance. This mechanic is similar to improvise in many ways. It's a fun mechanic that requires a lot of synergy to work well in tournament play. Because of the need for the right balance of enablers and payoffs, it can often end up being very swingy. This mechanic takes a bit of concentration to use because it requires being extra-aware of the zone changes of both you and your opponent's permanents. Judges reported that it needed an above-average amount of judge support. I believe the best chance for revolt's return is going to be a new environment that properly sets up revolt without having too many other mechanics that require focus. Players generally liked the gameplay of aftermath, but most disliked the layout of the cards. If we ever brought it back, we'd probably explore a different frame treatment. The best aftermath cards are ones that have two useful effects that, if you happen to cast them on the same turn, have synergy with one another. Having had to design some of them, I can tell you that it's more difficult than you might imagine. As with any split cards, there's also the desire to tie the effects to the names (aftermath uses "to" to connect the words, unlike the old split cards that used "and") which adds an extra layer of difficulty. Aftermath cards don't have a lot of requirements of the set they're in. They have a little synergy with a graveyard theme, so that's where I'd most expect to see it again. Play Design can handle aftermath cards as long as they're kept in small doses. Too many graveyard-value mechanics can lead to grindy games. Magic's normal momentum makes decks run out of steam over time, but too much "free" added value in the environment can warp things. Aftermath requires you to monitor cards that are active in the graveyard for all players, which can take a significant amount of concentration, especially in high volume. Aftermath plays well but has a lot of restrictions that make using it tricky. Add on top of that a card frame that was mostly disliked and you have a mechanic that has some issues to work out before we can bring it back. The Cartouche and Trial cycles were more designed for Limited than Constructed, but they had their fans. Both cycles have a lot of constraints making their design space pretty small. Each mechanic by itself is something we could explore in the future. The Cartouches are more limited in that the options for Auras are a much smaller band of choices. I do think Auras with an enters-the-battlefield effect have potential for us doing other interesting things. The Trials function basically like spells so they're a little more open design-wise, but they do require some synergistic element to bring back. Auras are normally tricky to balance for Constructed, but the enters-the-battlefield effects help a lot for creating value. Both the Cartouches and the Trials were developed more for Limited than Constructed as they have some repetition issues if pushed. The Cartouches require monitoring the graveyard if you're playing the Trials. Our need of value for Auras make the Cartouches the part I most see us returning to. The enchantment with an enters-the-battlefield effect is something we'll do again, but the returning element is something that requires the right environment. I don't see us doing both together again barring a return to Amonkhet, and even then, probably only if the return is set in the past. Cycling is the non-evergreen mechanic that's shown up in the most different sets. That's because a) it plays great and b) players really like it. You can add cycling to just about any effect on any card type. That's not even getting into extra tweaks we've made with cycling beyond the normal discard-to-draw effect. Of all the repeatable mechanics we've ever designed, it's quite possible that cycling has the largest design space. We have made the occasional "cycling matters" card, but generally speaking, any deck can just throw a cycling card in. Also, from a design perspective, there are very few sets that cycling couldn't be made to work if you threw it in. Cycling has a lot of "knobs" (numbers and costs that can be adjusted), making it one of the easier mechanics for Play Design to tune. Cycling is trickiest to balance in faster environments, of which Amonkhet was one. Cycling is very straightforward and easy to use. It's a mechanic we've found that most Magic players understand quickly when they first encounter it. Cycling is the poster child of a repeatable yet non-deciduous mechanic. I expect us to use cycling many times in Magic's future. Players have shown to like spells they get to play twice, so it's no surprise that a mechanic that lets you have two copies of a creature was also popular. In addition, it was super flavorful. The mechanic can work on just about any vanilla (no rules text) or French vanilla creature (just creature keyword abilities), but works best with creatures that have some advantage entering the battlefield twice (with things like enters-the-battlefield triggers). Each creature required its own creature token complete with art especially for it, so that puts some limits on how many any one set can have. While there are synergies that play nicely with embalm, it's definitely the kind of mechanic that can be splashed into just about any deck. Amonkhet mainly focused the mechanic in white and blue, but it could be used in other colors. The embalmed creature being a white Zombie ties the mechanic to the plane of Amonkhet, but I would argue so too does the flavor. The Play Design team didn't have too many problems with embalm, but there's a limit to how many creatures that return from the graveyard a Constructed environment can support. Each embalm creature had its own unique creature token. 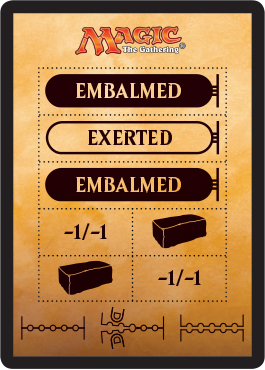 Also, tracking which creatures in the graveyard have embalm requires a bunch of attention from the players. Many mechanics are generic enough that they can work in most sets. Embalm, though, is very specific to Amonkhet, both in the Egyptian flavor and the tie to white Zombies. Its best chance of a return would come with a return to Amonkhet. I'm skeptical we'll see the mechanic show up on another plane. While this mechanic was liked by the more experienced players, it fared a bit poorer overall. I think this boils down to the fact that the mechanic is a bit Spike-y, requiring you to know when it's the right time to use it. Amonkhet used the effect as an attack trigger while Hour of Devastation experimented with using it as an activation cost. Each only goes on creatures and comes with its own limitations. Even with all those restrictions, there's still a relatively large amount of design space. Amonkhet did have some synergies with exert, but the mechanic can work in any set that has creatures that want to attack (aka every set). The attack-trigger version of exert tends to speed up the environment, so Play Design has to watch out for that. It's also hard in Constructed to have a creature mechanic that doesn't work for a turn. The creatures that did best in tournaments with exert tended to have haste for this reason. The activated triggers have more flexibility, but is trickier to balance and had less obvious Constructed design space. When we have to make a play aid to help remind you you've used an ability, that's a sign that there's a memory issue. I'm optimistic we'll see exert again. While not super popular, its good gameplay and design space seems like it's going to lend itself to many worlds. My best guess is that exert returns when it ends up being the answer for how to solve some problem with a new set. I expect this will happen sooner than later as exert answers a number of problems well. This is another one I'm guessing a bit on, as this isn't something we specifically asked players about. Based on the responses I got through social media, opinions seemed generally positive. It's kind of unfair to compare this to other mechanics because this is more of a tool than a mechanic. That said, this puts even cycling to shame. The design potential with this tool is enormous. This is another weird category to rate as the use of the tool requires a component in the set that it cares about. We wouldn't use a punch-out component if the set wasn't taking advantage of it. But looked at another way, if every set made use of this technology, we'd probably find a way to use it, so punch-out technology is hard to grade here. Punch-out components tend to help with mechanics with memory or marking issues. In general, that makes play design easier to do because it gives the audience a play aid. Requiring an extra component is what punch-out technology is all about, so obviously it requires using something other than the cards. I'm am very bullish on punch-out technology. As the person responsible for mapping out the future of potential design space, I see this as something that has the ability to shift what Magic is capable of. It's possible one day this will drop down to a 2 and be an ongoing deciduous part of Magic design. This mechanic got a bit of a "meh" response from players. They didn't hate it, but they didn't love it either. This is one of the mechanics that we thought would have a lot of design space when we first created it, but as we made cards, we quickly learned it had a lot more restrictions than we first thought. Afflict tends to want to be in a more aggressive set where creatures are more likely to be attacking. In small doses, Play Design has no issue with afflict, but it does limit how much we can use the mechanic in any one set. Its use also causes us to pull back on burn spells and other direct damage. Afflict is straightforward and doesn't require any memory or play aids. When we designed afflict, the idea was to make a throw-forward mechanic for War of the Spark, but the way it played out (and the way War of the Spark design worked), it didn't end up being a good fit, so the most obvious place for its return isn't going to happen. That leaves its future a bit up in the air. It's a simple enough mechanic, but has enough strikes against it that I only see its return coming if it's the perfect solution to a future design problem. Unlike exert, I don't see this as nearly as likely. Eternalize was designed as an embalm twist to capture Bolas's Eternals, so it's interesting to see the huge differential between embalm and eternalize. I'm not sure if players dislike eternalize in a vacuum or disliked it in contrast to embalm. Eternalize creatures are creatures that you embalm, but it matters that they come back as a 4/4. That tends to play into power matters–type designs. Eternalize was handcrafted to fit Hour of Devastation. For numerous reasons, it's not the kind of thing you could just pop into any set. Play Design had to jump through a lot of hoops to get eternalize to work. It was doable, but only because there was a small number of eternalize creatures, and they were mostly in higher rarities. With embalm, you could kind of get away with reusing the embalm creature if you didn't have the token. Eternalize really needed the token. Eternalize was designed as a very narrow answer to a story need. Between its unpopularity, low design space, and other issues, I'm skeptical we'll see its return. That's a wrap for today. I hope you all enjoyed the Storm Scale coming back. As always, I'd love to hear any feedback on this column or any of my ratings through email or any of my social media accounts (Twitter, Tumblr, Google+, and Instagram). Join me next week when War of the Sparks previews begin. Until then, may your favorite parts of Kaladesh and Amonkhet blocks return one day.